A magnitude 7.0 earthquake occurred Saturday, September 3, 2010 at 04:35:46 AM local time, 50km to the west of Christchurch, New Zealand and 80-90km to the southeast of the Australia-Pacific plate boundary. For the story on the ground in Christchurch, N.Z., see the Telegraph. The UNAVCO community has been analyzing incoming data and coordinating a response accordingly. Event response coordinator is Fran Boler, at boler unavco.org. Geophysical Event Response - the site for event response coordination. Forum - UNAVCO event response forum for community communication and coordination. See the update here on UNAVCO support available for this event and observations made by scientists in the field. GeoNet: GeoNet is a project to build and operate a modern geological hazard monitoring system in New Zealand. It is comprised of a network of geophysical instruments, automated software applications and skilled staff to detect, analyse and respond to earthquakes, volcanic activity, large landslides, tsunami and the slow deformation that precedes large earthquakes. YouTube video - a flyover of the trace faults by GeoNet. Photos of the offsets at the surface fault rupture on the GeoNet website. InSAR & Field Observations of the New Zealand Earthquake - on the COMET website gives lots of good background on the tectonic setting if this event. BBC Article on "Watching the Earth's Convulsions from Space" - a good explanation of how interferograms work and information on the N.Z. event. Photo Collection - More than 80 photos of earthquake damage, displacement and liguefaction features collected from a variety of sources. Hosted by Crashbang Co. of New Zealand. Powerpoint Slides (a fantastic set of 20 with a great deal of detail) are available on the New Zealand earthquake at the IRIS web page. Animations are also available on the IRIS Teachable Moment web page. Te Ara is a N.Z. government agency that has good maps, animations, and information on the tectonics of New Zealand. USGS has a good web page on this earthquake including location details, a shakemap, a maps aftershocks, and a description of the tectonics. Figure 1 - Satellite radar observations of ground displacement towards and away from the satellite. The interferogram is a contour map of ground motion with each colour cycle of blue through green to red indicating almost 12 cm of ground motion away from the satellite. Therefore the ground surface north-west of Christchurch has moved more than 8 colour cycles (fringes) away from the satellite indicating over a metre of ground motion along the satellite's look direction (which is 39 degrees from the vertical). Therefore this side of the fault has moved to the right, towards Christchurch. The ground surface to the south-west has moved 17 fringe cycles (almost 2 metres) towards the satellite and away from Christchurch. Courtesy of COMET. 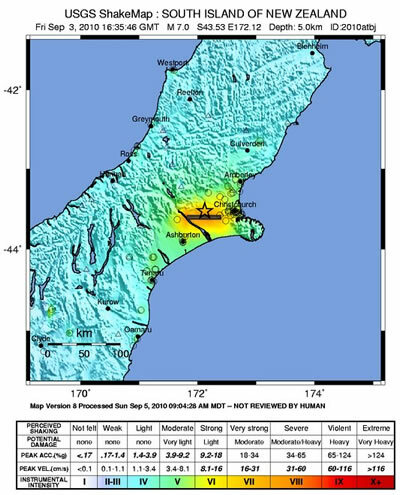 Figure 2 - Shakemap showing instrumental intensity for the September 3rd, 2010, earthquake in New Zealand, provided by the USGS. 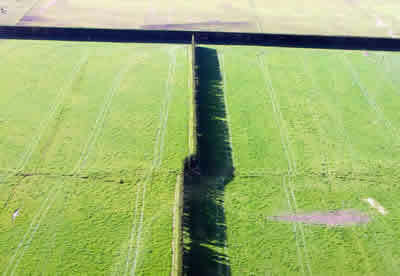 Figure 3 - Part of a 22 km-long fault rupture observed along the Last Glacial surface, oriented roughly west to east. The GeoNet organization of N.Z. writes: "Crosses and offsets to roads, fences, tracks and irrigation channels were observed. It passes directly beneath two houses and a farm shed, close to at least two other buildings, and under high voltage transmission lines. The trace comprises a series of en-echelon left stepping tears, and numerous cracks and pressure ridges. Patterns vary from field to field. There were numerous places where the offset could be measured – right lateral up to about 3 m, with variable vertical throw (mostly <1m). They could see no landform evidence of an earlier fault rupture along this trace." Image is provided by the GeoNet Organization of New Zealand. For more photos, see the GeoNet site. 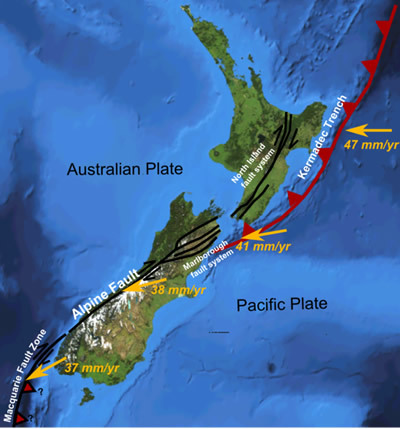 Figure 4 - A map showing major active fault zones in New Zealand, with displacement vectors between the Pacific Plate relative to the Indo-Australian plate, and the location of the Marlborough fault system. This earthquake likely resulted from a strike-slip offset possibly assocaited with one of these faults. Image produced by Mike Norton. 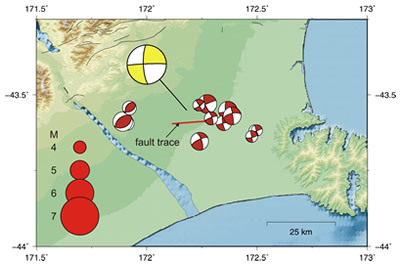 Figure 5 - Map showing the focal mechanisms and fault trace location for the September 3rd, 2010, earthquake on the South Island of New Zealand. Image is provided by the GeoNet Organization of New Zealand.